Mermaids and Unicorns are very popular with kids right now. And you can see why when they are usually so colorful and glittery. 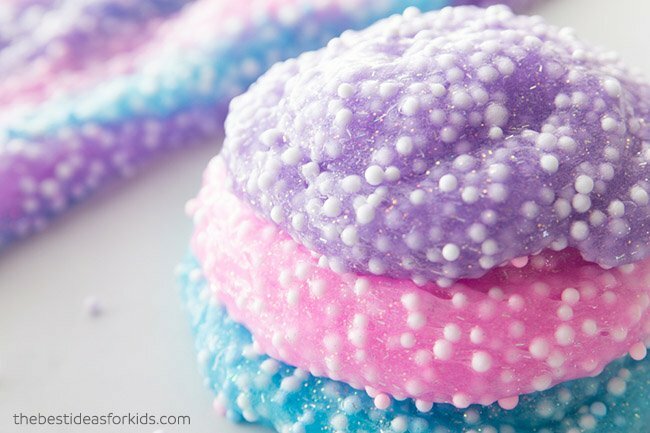 This mermaid slime is no exception! It is made to look just like a mermaid’s tail. 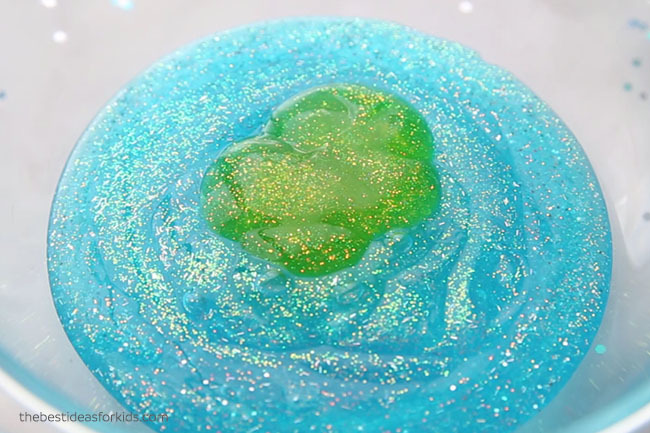 The slime is filled with glitter that looks like the scales on a mermaid tail. This would be perfect to make with the mermaid fan in your house or even for a mermaid-themed party. When we picture a mermaid tail we think of the colors blue and green and sparkling silver and blue scales on the tail. With that vision in mind we wanted to create a slime that looked just like a mermaid’s tail. 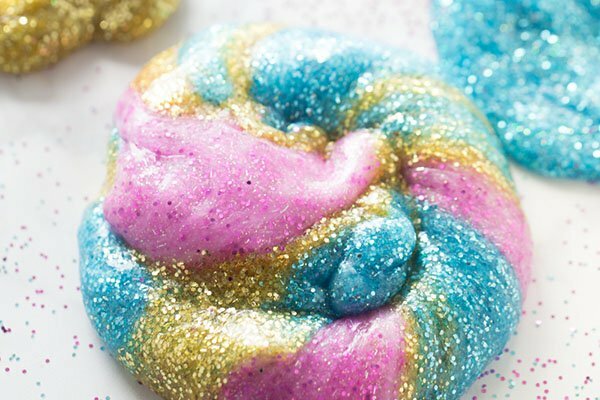 And if you’re a fan of unicorns too – we have 2 very fun unicorn slime recipes that would be perfect to make for a unicorn party – this Unicorn Fluffy Slime and a glitter glue Unicorn slime. If you’re looking for a general slime recipe, our base slime recipe can be found here: How to Make Slime With Contact Solution. We like to use contact lens solution instead of pure borax in our slime recipes. 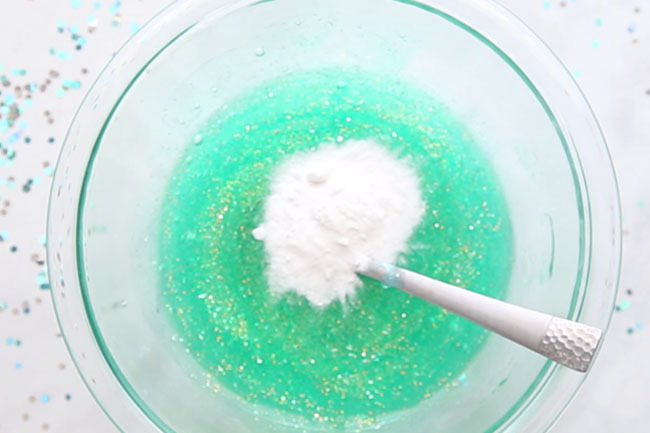 This basic recipe is what we used to make our mermaid slime. This slime is really easy to make and leaves little mess since you don’t have to use any food coloring. We like to use Elmer’s Glitter glue for this reason. 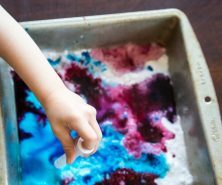 You won’t end up with any stained hands from having to color your glue with food coloring. If you want to make sure your slime turns out – be sure to read the instructions carefully. The type of contact lens solution you need and glue is very important! Substituting these ingredients for other brands may result in your slime not working. We have countless readers who have made our slime. The issue usually lies in not getting the right contact lens solution. Sometimes also not having quality glue can cause issues. This is why we always recommend Elmers. The other thing we love about what we’ve put into this slime is the glitter is chunky. This chunky glitter gives it more sparkle you can notice and is smooth on your hands when playing with it. We did test trying to make a mermaid slime with sequins and because the sequins are bigger, thicker, and less smooth the feel of the slime is not as smooth as this slime. Biodegradable Glitter – we have had some requests for a biodegradable glitter option. 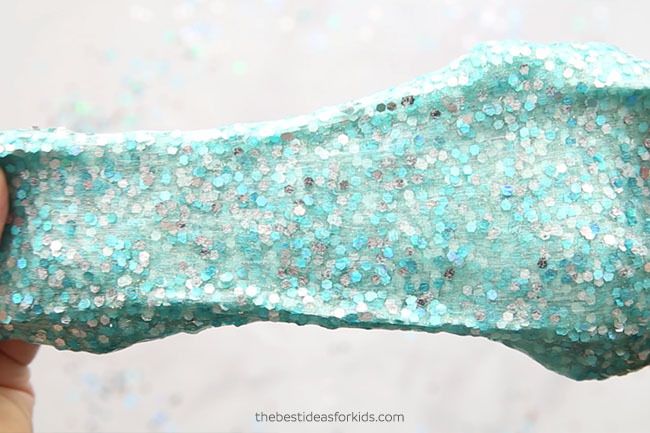 We found this chunky biodegradable glitter from Etsy as an alternative. Note that this glitter will start to break down after a few weeks when exposed to any liquid. Another option is you can buy Elmers Green and Blue Colored glue which does not contain glitter. You can also use clear glue and add food coloring to make it a teal color. Store in an air tight container and it should last at least 1 week. Usually much longer. We like to store in a Ziploc bag so we can press out all of the air from the bag. When not in use, we recommend placing in the air tight bag so that the air exposure does not dry the slime out. – 2 Bottles of Elmer’s Glitter Glue (6 oz). We used blue and green. Note: We have only tested this with Elmer’s glitter glue and recommend this brand as other brands may not work. – 1 TBSP or up to 1/4 cup of water which will make your slime stretchier. This is optional. – Chunky silver and blue glitter. The glitter we used was called Peacock Mix by Recollections from Michaels. – 1½ TBSP of Contact lens solution. **Important: your brand of contact lens solution must contain boric acid and sodium borate. We like this brand the best and use it in all of our slime recipes. See our full contact solution slime recipe for the brands we recommend. 2. 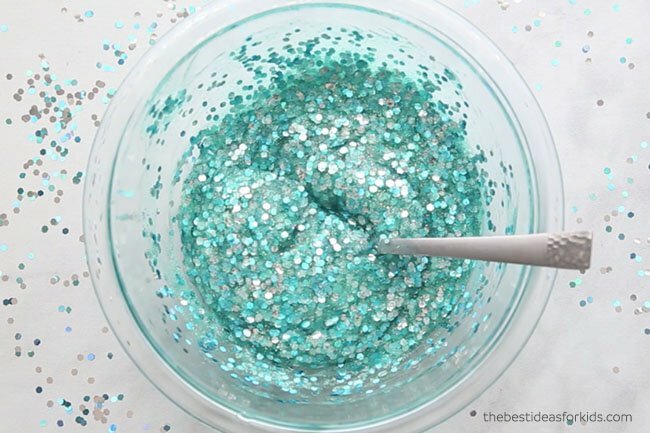 Empty your bottle of blue glitter glue into the bowl. Then add a little bit of your green glitter glue. Set the green glitter glue aside for another craft project. Mix both glues together. 3. Add 1/2 teaspoon of baking soda and mix in thoroughly. 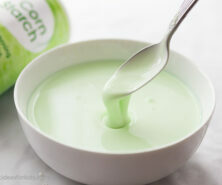 Also add 1 tablespoon or more of water here (up to 1/4 cup) if you want a stretchier slime. Then add in your chunky glitter and a little bit of fine blue glitter. We used a lot of the chunky glitter so that it covered the slime and looked more like a mermaid tail. You can find a selection of chunky glitter at a craft supply store – we got ours at Michaels. It is called Peacock Mix by Recollections. 4. Slowly add in your contact lens solution. Add it in a teaspoon at a time and then continue to mix. Reminder: your contact lens solution should contain boric acid and sodium borate or your slime will not form. We like this brand the best. See also our tips on How to Make Slime with Contact Solution. We like to add a few teaspoons of contact solution at a time and then mix. Once the slime starts to pull away from the bowl you can take the slime out and knead with your hands. It will still be sticky at this point and that is normal. Just keep kneading. If after kneading for 5 minutes it is still sticky, add more contact lens solution, a few teaspoons at a time. If you find it still too sticky after kneading try adding some baby oil or lotion to your hands instead. You can also add in more contact lens solution if you still find it too sticky. But we like to caution that adding in too much contact lens solution will make the slime become harder and not as stretchy to play with. Now your slime is ready to play with! 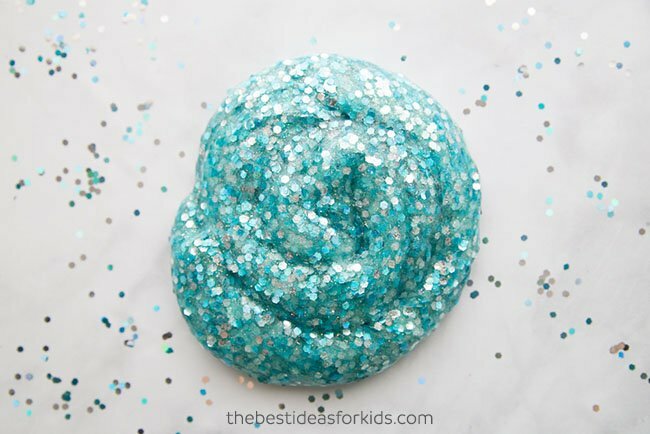 This slime is perfect to make for a Mermaid party or even just for the Mermaid-obsessed slime fan. 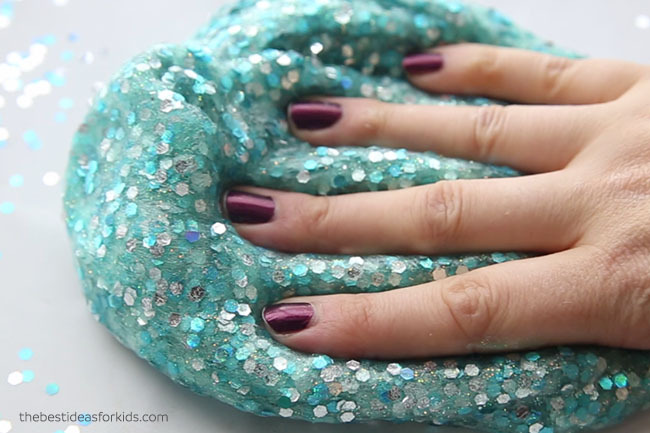 Kids will love stretching this Mermaid tail slime! This slime will last at least a week if stored in an air tight container or bag. We have found it usually will last longer too as long as it’s not sitting out exposed to air when not in use. We prefer to store in a Ziploc bag since it is easy to press out all of the air from the bag. 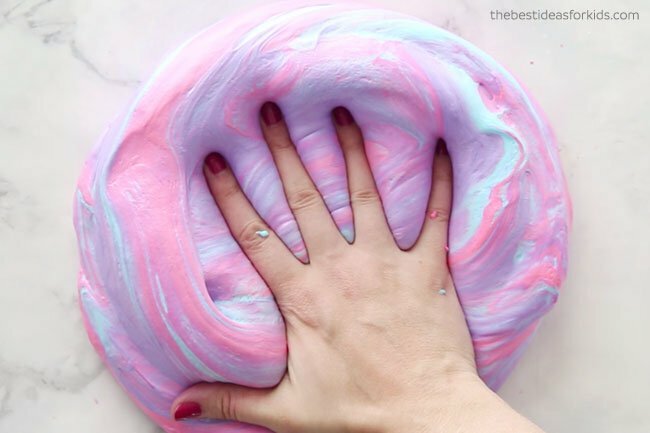 See our Unicorn Slime Recipe – one of our most popular slime recipes! Is the baking soda amount only 1/2 tsp? most other recipes I’ve seen call for 1/2 TBSP? Yes only 1/2 teaspoon. We have tested our recipes with less baking soda and are now only putting in 1/2 teaspoon as that is all that is needed. Too much baking soda and it actually makes the slime too hard. Hi Sandi – if it’s too runny it could be that your contact lens solution does not have the right ingredient to turn it into slime. The other thing is there could be too much water added in. You can cut back on the amount of water added and that should help! How much does one batch make? 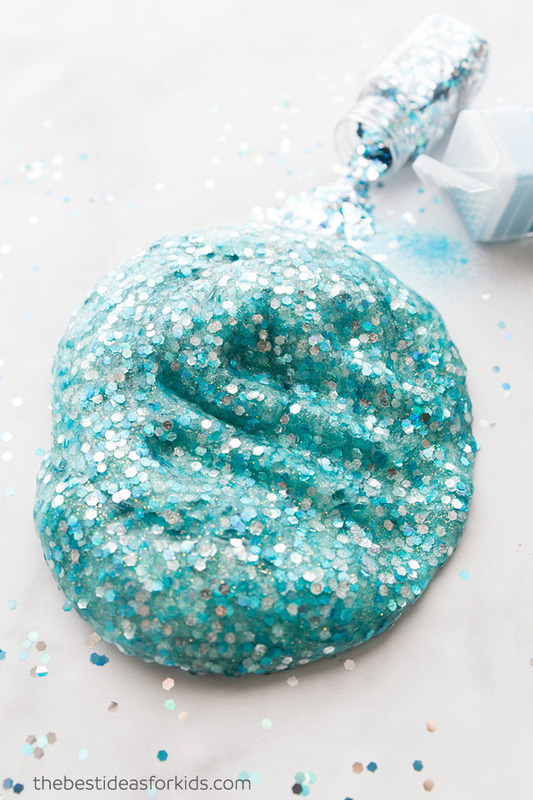 Need to make for a mermaid party and thought the slime would be cute in the goody bags. Thank you! One bottle will make 1 batch of slime but you could split it into 2 or 3 for smaller silly putty size amounts for a good bag. Thanks! what is the youngest age of child you would recommend playing with this? Is it ok for 2 1/2 year olds to play with supervised. We recommend ages 4 and up when they are not placing things in their mouths anymore. Thanks! So you need chunky glitter and fine glitter for this recipe??? My daughter loved making this! Great recepie! Love it! That’s great to hear Sasha! What’s the blue powder you throw in at the end? That is just extra fine glitter. Is this slime environmentally friendly? Hi Nimu – if you are concerned about the use of glitter we link to a biodegradable glitter option above in the post. You can also skip the glitter and just use regular colored clear glue. Does this stick to carpeting? It would if it was smooshed into the carpet. But it’s easy to get out of carpet just use a little bit of diluted vinegar and water and it easily dissolves the slime. How do you store the slime ? How long does it last? Looks like fun! How do you store this when finished? Or is it storable at all? Do you have to toss it after a few hours? What is the longevity of this craft once it’s made? Thanks! I love the idea of the mermaid slime but I just dont have clear glue but I have white glue. Other than that I have every thing else. 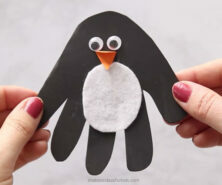 Evie – you could make this with white glue just get some food coloring to tint the white glue teal. We like to use Elmers glitter glue when we can though as it’s less messy. We hope you have fun making this! We will have fun with the slime.